This last week hasn’t been the best. Early on Friday morning we received awful news that two family friends had been involved in a tragic accident on the night before and that one had died. Memories of a similarly tragic accident involving a very close friend some years ago came flooding back and I was wading knee deep through rekindled grief. There’s nothing that can prepare you for sudden death – no defense mechanisms, just incredible sadness for the friendship you’ve lost and the helplessness you feel as you see their family trying to make sense out of senselessness. It’s as if time stands still. When my friend, Celia, died in a road traffic accident some years back now I was bereft. I still miss her jovial wisdom, her understanding and encouragement of my artistic endeavours and her support in difficult times. No one can take her place; it’s an empty space in my heart. The grief, coupled with the aftermath of coping with two divorces (my new husband’s and my own), tipped me into an abyss. I had a breakdown and was off work for six months. It was a dark time. I wouldn’t leave the house alone other than to see my counsellor. I accepted help from only those I really, really trusted. A few years later, quite unexpectedly, I was hit by an overwhelming sense of inadequacy and down I went again. Ongoing problems with an ex-partner, over-work and possibly remnants of previous issues sent me into the abyss again. I had the support of my workmates, my bosses, my doctor and my family so my recovery was quicker. I allowed more people to help me this time, although I succumbed to anti-depressants, something I had never wanted to do. Not long after this I started running. Running has given me a fresh perspective. Yes, I get depressed at times, everyone does. Yes, there are times of despair when everything is going wrong. Yes, I still sometimes feel overwhelmed, but this time I have a strategy. It cures nothing. It hurts sometimes. It doesn’t solve anything. Instead it clears my head, makes me focus on something else and I’m always moving forward. Not backward and not downward, just forward. I run and it gives me time and space to play out scenarios and allows me to get things into proper perspective. Sometimes it gives me an answer, something to try out later when I’m home and showered and my mind is more open. I’m about to go running again. This week hasn’t been the best. That’s it – the first race of 2014 is well and truly under my slightly expanded festive belt. This race has become a bit of a pilgrimage for us. The 5k I had entered was part of a much larger festival featuring some world class cross country running. Unfortunately this had meant that the entire event had been moved back a week due to TV scheduling, something which had also meant that it wasn’t worth opening my gallery after the Christmas break for a day only to close it again the next day! I know that I wasn’t the only runner who would have preferred the run to have been on the previous weekend. I hope next year that it is moved back! We arrived at the hotel in Leith, some two miles out of the city centre, late on Friday afternoon. After checking in we went across to the Ocean Terminal (which houses shops, department stores, a large cinema complex and many restaurants) and headed for Bella Italia where I knew I could get gluten free pasta and pizza. A mixed bean salad and lemon risotto was a welcome pre-race meal – filling and packed with energy. We retired early and, having turned off the noisy ventilation, enjoyed a good night’s sleep. My only worry was sleeping in. I’d set my phone alarm to wake us up, but as it was a new phone I was worried I’d done something wrong! I hadn’t and we were eventually woken by “Oh I do like to be beside the seaside.” It was a cold, frosty but clear morning with ice on the ground and bright sunlight bouncing off the buildings around us. We’ve got the journey to Holyrood Park down to a fine art. The 35 bus runs every 20 minutes, collecting us from immediately outside the hotel and deposits us a short walk from the park just 10 minutes later. I’d decided that catching the 10:08 bus was cutting things a little fine and so decided on the 9:58 bus instead. The race wasn’t due to start until 10:45 and I didn’t need to check my bag in as I’d put what little I needed in my rucksack and hubbie would hang onto that for me. We wandered around a little bit, but the grass was very muddy after a huge amount of rain and it was very cold. Rather than risk getting chilled I went into the baggage drop area to take off my jackets, put my phone arm band on and find a silver foil sheet from my bag to wrap around me. These are amazingly effective and more than made up for me losing two coat layers. By the time I’d wandered to the start area the warm up had already started. I entered the back of the green corale and joined in with what I could (whilst hanging onto a silver sheet). Before I knew it the hooter had been hooted and we were off! I’d set my Jeff Galloway 5k app to 9 min miles (which was pushing it a bit for both me and the course!) and running 4:1 intervals. The predicted finish time it had given me was just under 29 minutes. If I was fitter this might be possible, but truth is I’ve had to rein my running right back recently. This has just about cured my Plantar Fasciitis, but also left me gloriously underprepared for anything! You run along for a quarter of a mile and then you start to climb. And climb. And climb. And climb. In fact you basically climb for three quarters of a mile going from 40m up to 125 m in that time. It’s tough and I’m incredibly envious of those people who can run the whole thing. I managed to stick to my run:walk schedule for the first two intervals, but then I got caught behind slow runners and walkers. I do wish that they would, like I do, think about others trying to get around them and move across to one side. The path is narrow and it’s packed. If you get folk running slowly, especially with running partners, they effectively form a slow moving wall in front of you. After a walk break I was stuck behind a wall and tried to run on the sift grass to the right of the path, but this just zapped my strength and I ended up walking again not long afterwards. Next year I’ll keep right across to the left and see if that helps! My first mile reflects the hill climb, the running walls and all too frequent walk breaks and came in at 12:19. Although the climbing continues after the first mile it does so at a lesser pace. I managed to pick up my pace and stick to the set walk breaks. And enjoy the views! On the climb all you get to see are loads of backsides! Once you get to the top of the hill the whole of Lothian opens out in front of you and you feel as if you are on the top of the world. Enjoying the view also gives you chance to enjoy the race. Mile 2 came in at 10:31. Better, but my average pace was still over 11 min/mile pace. However the best bit about this race is the last mile. It’s downhill. Well pretty much all downhill. Flat out downhill. Magic! I picked up my heels and leaned into the hill and went for it as safely as I could. I felt good. No heel or calf pain, but a little hip pain in my right hip. It was nothing that was going to slow me down. My best pace was 7:04 min/mile. The last third of a mile is on the flat and I must admit I was tiring out. Last year I had my hubbie to spur on to the finish and this spurred me on. This year it was all about me. I had to focus on catching someone ahead of me, so I randomly chose a girl ahead and raced to catch her. Amazingly I caught her as we crossed the line. My last mile was 8:34, one of the fastest miles I’ve ever run. My 3:13 miles came in at 32:34.2 Garmin time, 32:35 chip time giving me an overall pace of 10:25 min/mile. I am happy with that. If I’d had less time off through injury, trained more and covered more miles I might have been a little disappointed not to get closer to 30 minutes, but instead I accepted the time gratefully. I’d knocked 4 minutes off last year’s time (chaperoning my hubbie), run my own race (pretty much) and not suffered any real pain as a result. Today I’m a bit stiff in the right hip flexor and unsurprisingly my quads are aching like mad! I’ve done 30 minutes of yoga this morning which has helped with the muscle ache and stiffness. At least the aches show that I tried very hard! I received an excellent Goodie Bag as ever, complete with a T-shirt and medal. Unfortunately there wasn’t one thing in the bag I could eat – everything either had nuts or gluten in it! Hubbie thinks that it’s Christmas all over again! 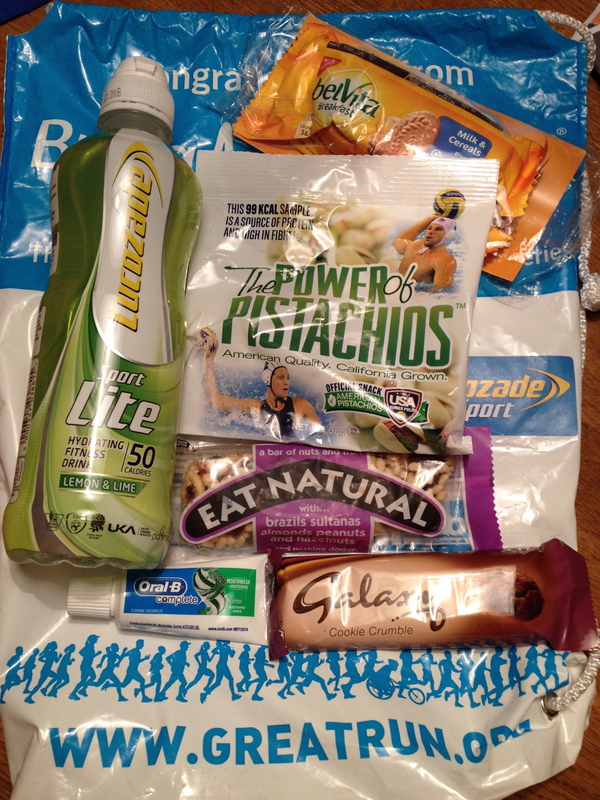 The Goodie Bag! Full of gluten and nuts – arghh! We didn’t stay to watch the cross country. We had to get back to the hotel so that I could shower and vacate the room before 2pm. As it was we were out before 1 o’clock and then went for a very cheap lunch at the Handmade Burger Company in the Ocean Terminal. I’d been given a voucher for a £1 burger which meant that we only paid full cost for one meal. On the menu there were a few gluten free vegetarian/vegan options and I chose a chickpea and quinoa burger – which was delicious. Highly recommended! Will I do this next year? Yes, of course! It’s expensive for a 5k, but not as expensive as some events I’ve recently seen advertised. I’m determined to conquer that climb! I’d love to knock a minute off my time, at least! Above all I like the fact that we are in a city I love. We make a weekend of it – enjoy relaxing in familiar places, visiting favourite haunts. It’s not just about a race; it’s about tradition. 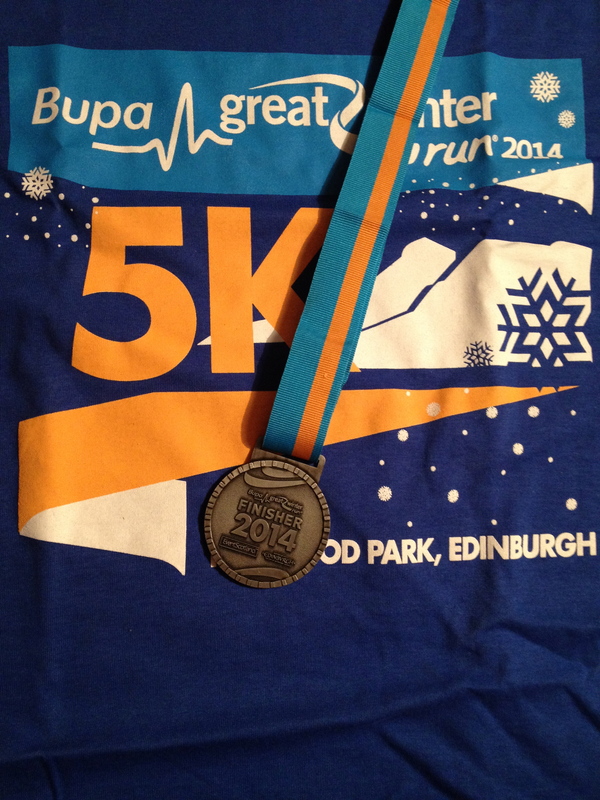 On Saturday I’ll be running in BUPA’s Great Winter Run in Edinburgh. It’s a race I’ve done for the last couple of years, chaperoning my reluctant running husband around the demanding route up and around an extinct volcano in Scotland’s capital city. ‘Chaperoning’ isn’t maybe the best word I could pick – ‘bullying’ is probably more apt. Poor Grant. At the end of the first race in 2011 he said he thought he would die, after last year’s he thought he was going to be sick. How annoying, then, that I looked (and felt) as if I could run it again! Last year he announced that enough was enough, he wasn’t a runner (even though his 5k PB was an impressive 32:19 – not bad for someone who only trained for this race) and next year he’d be support crew. Although I miss bullying him (although I’m sure I can find other times/ways to do that), I’m quite pleased that this year I will be running my own race. However this week has been a bit of a anti-climax. 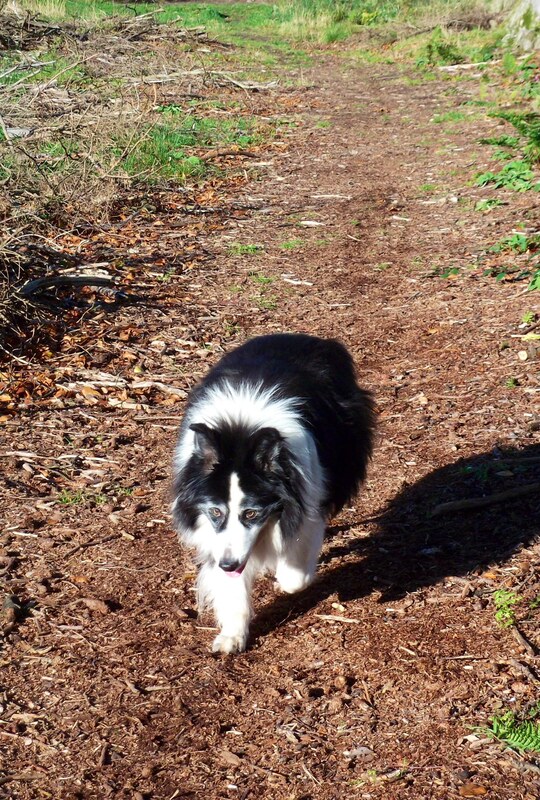 Our 16 year old Collie dog, Badger, has spent the last couple of weeks quickly deteriorating health-wise and our usual plans to make a weekend of this race went straight out of the window. He was our priority. We changed our plans to travelling the two hours to Edinburgh early on race morning and then coming home immediately afterwards. My son would be on hand to watch him whilst we were away. Sedated anyway, having suffered repeated seizures since before Christmas, he didn’t go far or do anything for that matter. Yesterday, though, we made the sad decision to let him go. The seizures weren’t improving, the drugs weren’t working and the dog he once was, the happy go lucky bouncy Collie, was disappearing behind a veil of age inflicted maladies. We didn’t want that, for him or for us. He crossed the Rainbow Bridge last night. And we miss him. Hesitantly and tearfully we are remaking plans. Today is a beautiful and calm day – the first for a while here in south west Scotland. I have my running gear on and my wee dog, Murphy, is desperate to get out and run with me. Once upon a time Badger would have joined us, but eventually it became apparent that he simply couldn’t keep up anymore. Try as he might. The dog that saw my running obsession start five years ago will today join us in spirit. And I know he’ll be there. Only this time he will be able to keep up, unfettered by old age, arthritis and lung congestion. Today’s run will be for him. And I can’t stop the tears from flowing. We’ll travel to Edinburgh tomorrow and I’ll be fuelling up at Bella Italia at the Ocean Terminal, where they cater for those of us following gluten free lives extremely well. Hubbie and Murphy Dog will form Support Crew on the day and I plan to run 3:1 ratios up and whatever I can down the hill. If I can get close to my 30:32 5k PB I’ll be happy. I haven’t trained much – thanks to Christmas, New Year and that ever present Plantar Fasciitis – so whatever I achieve will be gratefully received! My foot feels good at the moment and Monday’s trip to my chiropractor helped loosen that calf and Achilles Heel off further. Hopefully it will be a Great Winter Run! When is your first race of 2014? A couple of months back I had an adverse affect to an Athlete’s Foot infection, well documented with gruesome photos here! I said at the time that I would review the very excellent product I used to combat the infection and also treat the reaction, known as ID. Athlete’s Foot is a skin condition that affects the sole of the foot and the skin between the toes. It is usually a scaly, red, itchy eruption and occasionally may be weepy and oozing. It is generally caused by a fungal infection. The medical name for Athlete’s Foot caused by a fungus is tinea pedis. There are a variety of fungi that cause Athlete’s Foot and these can be contracted in many locations and from contaminated socks and clothing. The fungi can also be spread directly from person to person by contact. 3. Inflammatory type or blistering type. Most cases of Athlete’s Foot are barely noticeable with just slightly dry, flaky skin. A more extensive infection may appear red, peeling and dry on the soles of the feet, sometimes spreading onto the sides and tops of the feet. The space between the fourth and fifth toes also may have some moisture, peeling and dry flakes. The skin between the toes may split. Athlete’s Foot is very contagious. Many people do not even realise that they have Athlete’s Foot at all, so essentially good foot hygiene is a must. As AF is a fungus we need to make the area less ideal for a fungus to thrive, so wearing cotton socks and keeping the feet dry and cool is a better prevention than having to find a cure! Wear shoes made of breathable materials and use powders in shoes to absorb moisture and treat fungus build up. Many topical medications (i.e. creams applied to the skin) are available to treat an infection. A quick internet search will point out the most popular. I tried treating my Athlete’s Foot infection using Canesten Dual Action Cream (containing Clotrimazole) but it had no effect. Very quickly, though, my infection went from ordinary Athlete’s Foot to an allergic rash called Dermatophytide (ID or IDE) possibly because I have sensitive skin. Essentially I was allergic to having Athlete’s Foot, if that makes any sense! The symptoms included blisters, swelling and an itchy, red, burning rash which covered the entire front of my foot. I couldn’t bend my foot at the height of the infection, it was very swollen. 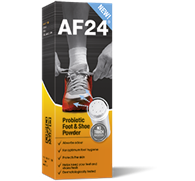 AF24 Spray is particularly suitable for treating athlete’s foot, when it has spread to larger areas of the feet. Like all other AF24 products, the spray contains only natural occurring chemicals and none of the toxic ingredients used in various other available products. How does it work? It builds on the human body’s own defences, by using natural acids to normalise the skin’s pH in the affected areas. Subsequently, the fungus that causes athlete’s foot will be unable to ‘survive’. Hygiene is key in the treatment (and prevention) of athlete’s foot. Because of its ‘no touch’ approach, AF24 Spray is not only easy to use but also the most hygienic way to go together with AF24 Clic & Go. On spraying the product onto my skin I felt a slight burn, but knew from reading the blurb that this was a natural reaction. I used the product twice daily and within a day the infection was noticeably reduced. The slight burn sensation reduced on each application. Within three days the infection was almost cleared. I continued to use the product for seven days and also used a probiotic shoe powder made by the same company to ensure that any fungus left in any shoes was destroyed. The infection was treated quickly and effectively and I am pleased to have found this product. It was bought over the counter in Boot the Chemist, so is widely available. Totally recommended! As the first day of 2014 it’s a very dull, rainy and windy one. Which is a terrible shame. I had high hopes last night in the local pub of doing fantastic things today. However I’ve long since found that plans made in the pub, Guinness in hand, are often poorly done. Instead I have cooked a hearty Lentil and Mushroom Shepherd’s Pie and started planning my race calendar. If you want my gluten free vegetarian recipe, please ask. It is delicious, even served with aging Brussel Sprouts. After much deliberation and despite concerns about training inflicting further pain, I’ve picked three half marathons for 2014. I’ve chosen, and for very different reasons, the Edinburgh Marathon Festival Half,the Fleetwood Half Marathon and the Great Cumbrian Run. The Edinburgh Half is part of a bigger running festival which also includes a 5k, 10k, a full marathon and a Team Relay (amongst other things). Last year I did the Rock’n’Roll Half in Edinburgh. It was a terrible weekend and I struggled in vain to better my GNR time on the day in gale force conditions. This year the organisers have decided to move the event to the end of June, possibly in an attempt to avoid bad weather (although as this is Scotland that mightn’t be possible!) This year, however, I thought I’d treat myself to a more PB friendly course and do it a month earlier when the weather might be a little cooler. I’ve gone the whole hog and booked the caravan into Silverknowes and bought us Park and Ride bus tickets to get us to and from the start and finish. The Fleetwood Half Marathon takes place on the weekend after my 50th birthday so it will be my first of my fifth decade. Really I should be looking at lovely hotels and booking myself a pre and post race massage, but I’m guessing I’ll be checking out the local campsites and settling for a brisk rub down with a fluffy towel. This is known as racing on a tight budget! I don’t know much about this race at all. Last year, in great pain, I completed the Great Cumbrian Run. This year I’m determined that my 13.1 miles won’t be as uncomfortable. It was nice to do a local half marathon (most of the local ones seem to take place on a Saturday and I have a gallery to keep open) and take in places I’d visited before in less arduous conditions. I’d like to run through the villages with more of a smile than a grimace! So that was on my ‘To Do Again’ list. I’ve got a few other shorter races on my list – Kilomathon 13.1k, X Borders Challenge 10k (Gretna to Carlisle), Gallovidan 10k (Dumfries), Jedburgh 10k – but I haven’t entered any of those as yet. I think if I concentrate on completing three half marathons without huge problems that will be enough. That’s the only resolution I’m making, the only goal I’m setting. I’ve spent far too long worrying about what others say and think. This year I intend hold my head high and do my own thing, at my own pace.